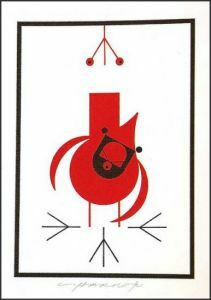 This image is from the art of Charley Harper, 'Charley's Cardinal issued in 1999. I am only making 50 tags. I would like to trade for Charley Harper tags. If you don't have a Charley Harper tag to trade, but have something I collect please wishlist. The estate of Charley Harper has provided permission for the use of the artwork with the understanding that these tags will NOT be sold due to copyright laws.